I welcomed in May last weekend with an another early morning rise at 4.45am, (my husband being more sensible just rolled over, and stayed in bed! ) However, just look what he missed - the colours in the sky were just breath- taking. So why was I up again so early? I was following an ancient tradition of getting up before sunrise on 1st May, I didn't wash my face in the morning dew or bring in garlands of flowers, but instead watched some local Morris dancers celebrate by dancing on Stonebarrow Hill. (For further details of May celebrations see here.) Did you do/see any celebrating on May Day? It's good to see these traditions to celebrate nature's seasonal make-over haven't completely died out. Although it looked so beautiful, it was so cold, I had to scrape the ice off the car window before setting off. Those watching were wrapped in warm coats and hats while the dancers, wearing just white shirts and trousers, really felt the cold! 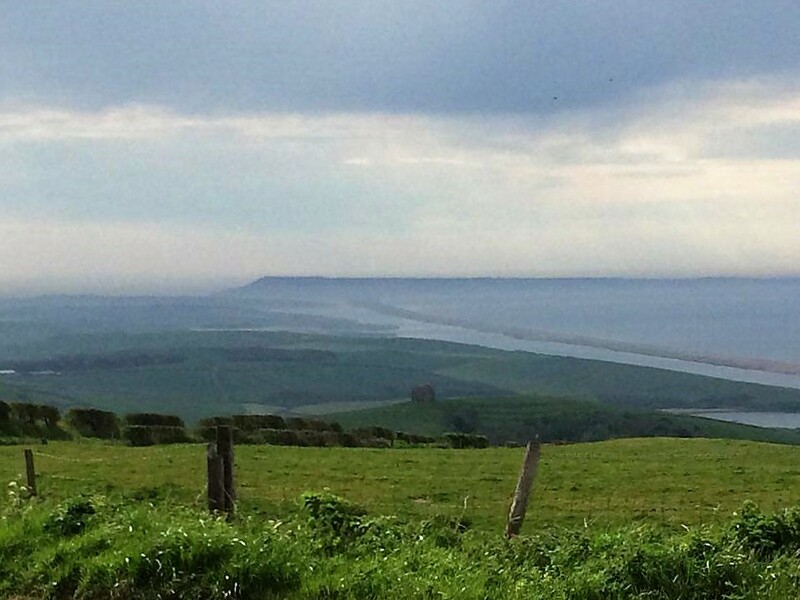 This image below could so easily be straight out of the pages of a Thomas Hardy novel! and the sun slowly rose in the sky, at the end of the lane, and you could instantly feel and welcome it's heat. I couldn't resist a detour on the way home to Charmouth beach, which not surprisingly at 6.30 am was deserted, apart form a distant lone walker. The beach huts I mentioned back on this blog in the Autumn, were back in place, ready for another season. Later in the day, walking through woods smothered in a carpet of wild garlic, we spotted this deer, who was just standing very still watching us. It was lovely to see fresh green leaves appearing overhead. This week everything seems to be just bursting into life before your eyes! The fields close by are now full of sheep and lambs. It is wonderful to see them jumping around and enjoying the May sunshine. or on the apple trees in our garden. Last evening we took another walk in a different direction, up Eype Down and I accidentally discovered how to capture that vivid blue colour of the bluebells that previously has eluded me. The solution is to take the photographs at dusk! The added bonus, was the scent from the flowers was much stronger in the evening too. Thank you as always for your comments and popping by to visit me, wishing you a fun week! I will try your tip about the blue light at dusk and the bluebells - that is a wonderful shot with Tavi. Lovely post Sarah. Beautiful post! The photos are great! I love the new green on the trees this time of year, though it will be later here in eastern Canada. Oooh, your photos are exquisite of both the sunrise and the Bluebells! I took some on my blog yesterday but I went around Midday! Will try to go towards Dusk!It IS nice to hear that some traditions are still kept! that all looks and sounds idyllic. Apart from being so cold you had to scrape ice off the windscreen. It is great to hear about the 1st of May tradition. The morning must have been magical. We've had an unusually warm week and I can't believe how quickly everything is turning green, although we are still at least a couple of weeks from apple blossoms. Great photos. I love especially that of the bluebells. The colors of your morning sky are truly amazing! And just when I think I've chosen my favorite photo I see the lambs.....and then I see Tavi in the midst of all those Bluebells! Beautiful pictures! It's my dream to live by the sea sometime. And I'm not getting any younger. I love the rolling hills photo! Gorgeous photos, all of them. I do love the freshness of spring with everything new again. What a lovely post! The carpet of bluebells is enchanting and the colors so vivid. I remember when I lived in England while going to school, the youngest daughter of the family I lived with had been selected as the May Queen – she had a pretty white gown. Here in the US nothing happens on May 1st because they feel it is a communist holiday. At home, in Paris, my father would buy my mother and me some lily-of-the valley as it is the custom for May 1st – to wish you happiness and luck for the whole year. I love early mornings too Sarah, my favourite time of day with birds singing and people silent...just perfect. The photos are beautiful, especially the bluebells. I was looking at miniature apple trees in the garden centre yesterday and admiring the blossom. Vielen Dank für diesen wundervollen Post! Deine Bilder erfreuen mein Herz. Das erste ist sooo schön, dieser Himmel. Durch ein Bärlauchfeld bin ich einmal in England gewandert, hier bei uns noch nie. Aber ich wandere auch nicht oft, sehr selten. Oh Sarah, my heart is rejoicing to see how the other side of the pond responds to spring. 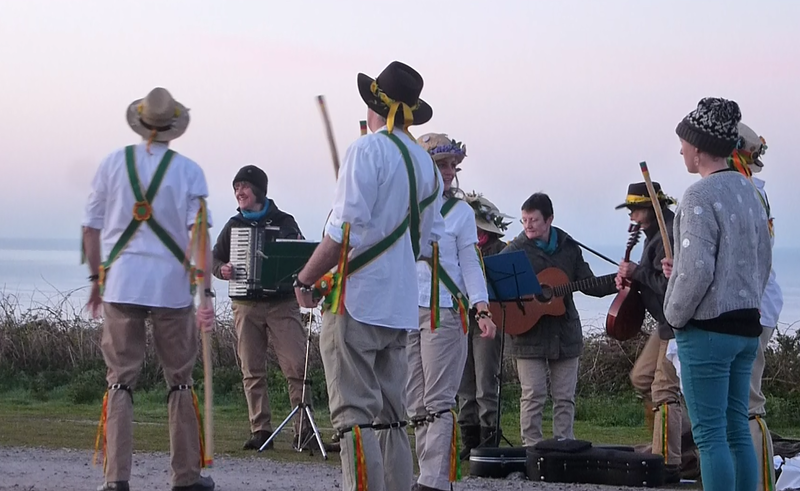 I love to see that the tradition of the Morris dances are still in the hearts of the young, that your sunrises are as beautiful as mine, that your seascape is one of the first things you see. Magic, enchanted beauty, LOVE surrounds YOU! I envy you your photos of blue bluebells. Mine always come out a bit faded... looks like your weather is as good as ours currently is in Hastings. Beautiful Sarah, just beautiful. And I love the furry white one amidst the flowers! Well worth getting up in the middle of the night. Every photo is lovely (they always are), but the bluebell photos had me swooning! A lovely post. I did enjoy it. Your photos show how beautiful May is. It is fun witnessing the old traditions and I agree, it is very Thomas Hardy. I'm sure he would have loved it! The deer is gorgeous and the bluebells are stunning. Just astounding Sarah. I can't think of a more beautiful place. Beautiful photos of our beautiful country - and its ancient traditions! I think the Bluebells have been really special this year, but as you point out it's very hard to capture their colour in a photograph. Your photos are always so beautiful...I feel I am there. You captured that 'hurt your eyes' blue perfectly with your white furry puppy looking out. What a wonderful start to May! I hope that the rest of your month is just as lovely! Dearest Sarah and Tavi! Thank you for sailing across the big pond to see our spring here in the upper midwest of the states! OHHHHH, the colors are rich this year! I love that photo of the trees leafing out, just beautiful. And as I've been struggling with bluebell pictures today, now I know, I shall try it again at dusk! I don't think I could get up so early in the morning, but it was obviously worth it to see those lovely colours. Maybe I should try it one morning! Yes, everything is coming to life now in the gardens and the countryside, it's amazing how much things grow in just a few days. I would have gone back to sleep at 4:45, too! That's way too early for me. The field of bluebells is just beautiful! Tavi in the bluebells!! And those lambs are very Thomas Hardy. Your photos are sublime. Interested to see the Morris Dancers at Stonebarrow and the way the light changes over Golden Cap. Sounds like it was well worth getting up early. You are so wise to get up and make the most of a glorious day. Whenever we get up early we always think that we should do it more often. The flowers are lovely especially the bluebells, what a magical joy they are at this time of year, and it looks as if you are in for a bumper crop of apples later in the year. Beautiful photos of the countryside in May - I love these spring months especially when the sun shines - shame it's back to rain again - oh well, it was nice whilst it lasted. Such beautiful photo's ... my favourite has to be the one of Tavi among the bluebells ... but they are all great shots. I always think April is great and then May comes and it is such a good month too. The lambs were gamboling! How often can you use that word! Lovely photos, the one of your westie in the bluebells is adorable. Spectacular photo's Sarah! Your husband missed a lot indeed! Very beautiful photos. I liked the dance!! The wild flowers are magical. We do not do anything special for May Day around here or none that I know of it. I truly enjoyed the post! Thank you. A wonderful tradition to welcome in May and I enjoyed seeing your beautiful photos. It is my favourite time of the day too. The light in the sky, the bluebells and the beach huts, all so beautiful. Your beautiful photos once again have me pining for a day out in the English countryside. The bluebells looks wonderful! Good for you for getting up for that early morning outing! Thank you for the beauty you share here, Edyth in Texas which is very different. Oh my, I have photo and location envy!